What happened to Taco Bell? If you’ve driven down Del Paso Blvd lately, you may have noticed Taco Bell was torn down. 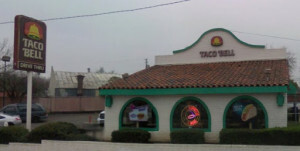 This Taco Bell was one of the older, mission-style ones; something that made it really unique. Interestingly enough, the Taco Bell sign was left standing, suggesting the venue may be replaced. Hopefully it will be; it seemed like a pretty busy place. November 11, 2009 in Development.